Seth W. Godin is an American author and former dot com business executive. In March 2006, Godin launched Squidoo. In July 2008, Squidoo was one of the 500 most visited sites in the world. By 2014, it was no longer considered financially viable and was sold to HubPages. Godin is the author of 18 books. Free Prize Inside was a Forbes Business Book of the Year in 2004, while Purple Cow sold over 150,000 copies in more than 23 print runs in its first two years. The Dip was a Business Week and New York Times bestseller; Business Week also named Linchpin among its "20 of the best books by the most influential thinkers in business" on November 13, 2015. In the early 1990s, he curated a 10-book series for children titled Worlds of Power. Each of the book's plots is based on a video game. In June 2013, Godin raised more than $250,000 from readers with a Kickstarter campaign, which in turn secured him a book contract with his publisher for his book "The Icarus Deception." Godin was inducted into the American Marketing Association's Marketing Hall of Fame in 2018. Seth Godin's blog was named by Time among its 25 best blogs of 2009. Seth Godin's podcast started on 14 February 2018 and is named Akimbo. Episode 1 of the podcast is entitled The Grand Opening and subtitled "Hype, hoopla and the bally". Godin, Seth (1993). The Smiley Dictionary. Berkeley: Peachpit Press. ISBN 1-56609-008-3. Godin, Seth (1995). eMarketing: Reaping Profits on the Information Highway. New York: Berkley Pub. Group. ISBN 0-399-51904-1. Godin, Seth (1999). Permission marketing: turning strangers into friends, and friends into customers. New York: Simon & Schuster. ISBN 0-684-85636-0. Godin, Seth (1998). If You're Clueless about Selling: And Want to Know More. Dearborn Financial Publishing. ISBN 0-793-12989-3. Godin, Seth (2002). The Big Red Fez: How To Make Any Web Site Better. New York: Free Press. ISBN 0-7432-2790-5. Godin, Seth (2002). Survival is not enough: zooming, evolution, and the future of your company. New York: Free Press. ISBN 0-7432-2571-6. Godin, Seth (2003). Purple Cow: Transform Your Business by Being Remarkable. New York: Portfolio. ISBN 1-59184-021-X. Godin, Seth (2004). Free Prize Inside! : The Next Big Marketing Idea. New York: Portfolio. ISBN 1-59184-041-4. Godin, Seth (2005). All Marketers Are Liars: The Power of Telling Authentic Stories in a Low-Trust World. New York: Portfolio. ISBN 1-59184-100-3. Godin, Seth (2006). Small Is the New Big: and 193 Other Riffs, Rants, and Remarkable Business Ideas. New York: Portfolio. ISBN 1-59184-126-7. Godin, Seth (2007). The Dip: A Little Book That Teaches You When to Quit (and When to Stick). New York: Portfolio. ISBN 1-59184-166-6. Godin, Seth (2008). Meatball Sundae: Is Your Marketing out of Sync?. New York: Portfolio. ISBN 1-59184-174-7. Godin, Seth (2008). Tribes: We Need You to Lead Us. Portfolio. ISBN 1-59184-233-6. Godin, Seth (2010). Linchpin: Are You Indispensable?. Portfolio. ISBN 1-59184-316-2. Godin, Seth (2011). Poke the Box. Portfolio. ISBN 1-936719-00-2. Godin, Seth (2011). We Are All Weird. The Domino Project. ISBN 1-936719-22-3. Godin, Seth (2012). The Icarus Deception: How High Will You Fly?. Portfolio. ISBN 0-6709-2292-7. Godin, Seth (2012). V Is for Vulnerable: Life Outside the Comfort Zone. Portfolio. ISBN 978-1591846109. Godin, Seth (2013). Whatcha Gonna Do with That Duck? : And Other Provocations. Portfolio. ISBN 978-15918-4609-3. Godin, Seth (2014). What To Do When It's Your Turn (and it's always your turn). Seth Godin. ISBN 978-19367-1931-0. Godin, Seth (2018). This Is Marketing: You Can't Be Seen Until You Learn To See. Seth Godin. ISBN 978-0-525-54083-0. Godin and his wife Helene live in Hastings-on-Hudson, New York with their two sons. ^ a b Trachtenberg, Jeffrey (June 24, 2012). "Giving Book Readers a Say". Wall Street Journal. Retrieved 18 July 2017. ^ Walker, Rob (November 14, 2014). "Self-Promotion, but With Self-Respect". New York Times. Retrieved 18 July 2017. ^ Adams, Bryan (April 28, 2016). "The 3 Rules of Successful Business as Taught by Seth Godin (and Your Mother)". Inc. Retrieved 18 July 2017. ^ a b Kuntz, Mary (September 9, 1998). "Entrepreneur Profiles: Point, Click--And Here's The Pitch: Yoyodyne uses prizes to get you to read those online ads". BusinessWeek. Retrieved December 20, 2014. ^ Taylor, William C. (March 31, 1998). "Permission Marketing". Fast Company. Retrieved October 8, 2017. ^ Junnarkar, Sandeep. "Yahoo to buy Yoyodyne". CNET News. Retrieved 19 December 2013. ^ Yahoo Acquiring Yoyodyne Wired.com. October 12, 1998. ^ "Speaker: Seth Godin". Business Week's "Ultimate Entrepreneur for the Information Age". Special Libraries Association. June 18, 2008. Archived from the original on July 4, 2008. Retrieved December 20, 2014. ^ "Seth Godin's Squidoo Acquired by HubPages". SearchEngineWatch. August 19, 2014. ^ "Forbes.com Business Book of the Year". Forbes. Retrieved 2014-01-20. " ^ Hogan, Ron (2005-05-16). "How to Succeed in Business (Books)". Publishers Weekly. Retrieved 2014-01-20. "...reports that the two-year-old title has more than 150,000 copies in print after 23 printings"
^ Feloni, Richard (November 13, 2015). "20 of the best books by the most influential thinkers in business". Business Week. Retrieved October 8, 2017. ^ Richards, Katie. "Meet the 3 Newest Members to The American Marketing Association's Marketing Hall of Fame". Adweek.com. Retrieved 4 June 2018. ^ "Seth Godin's Blog". Time. Retrieved October 8, 2017. Wikimedia Commons has media related to Seth Godin. "Seth Godin – Full Stop Failure". Subvert magazine. Interview. Archived from the original on Dec 7, 2011. Marshall, Colin (Apr 1, 2010). 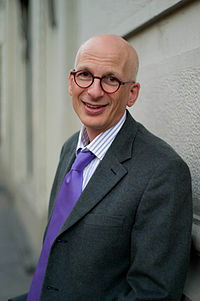 "Thinker, writer, and "Agent of Change" Seth Godin" (podcast). Interview. Notebook on Cities and Culture (Formerly The Marketplace of Ideas).